Results of the phase-feeding studies suggest phase-feeding strategies provide advantages in growth performance over feeding a single diet throughout the grow-finish phase. In commercial production, phase-feeding programs have been widely used to closely meet the nutrient requirements of grow-finish pigs and to reduce nutrient excretion to the environment. Moreover, simplification of feeding strategies to fewer phases can maximize growth performance and carcass characteristics while providing potential advantages in logistics of feed delivery and storage in the swine production system and improvements in feed mill efficiency. The core component of developing a phase-feeding program consists of setting dietary lysine. Generally, feeding programs with fewer dietary phases provide lysine levels below the requirements initially and rely on compensatory growth later on when lysine levels are adequate. To continue to understand proper diet formulation relating to different phase feed strategies, two studies were conducted to more specifically evaluate different lysine level programs for grow-finish pigs. Phase-feeding programs consisted of one, two, three or four dietary phases throughout the grow-finish period. Lysine levels (Table 1) were closely set to the estimated requirements for maximum growth rate (Experiment 1) or were slightly below the estimated requirements for maximum growth rate to simulate a field approach on lysine levels (Experiment 2). Experiments were conducted under commercial research conditions with approximately 1,100 pigs (PIC 359 ´ 1050) per experiment from 60 to 280 pounds of bodyweight and 25 to 27 pigs per pen. 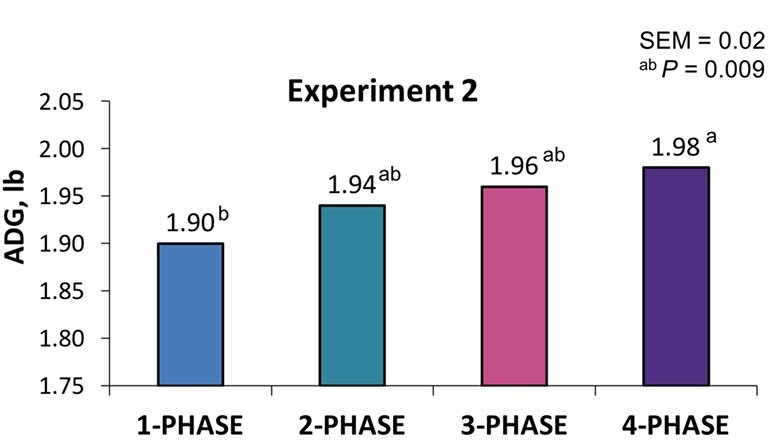 In Experiment 1, pigs fed the one-phase program had lower average daily gain compared to those fed the two- and four-phase feeding programs, with the three-phase feeding program intermediate (Figure 1). The lower growth rate of pigs fed the one-phase program resulted in lower final bodyweight and hot carcass weight compared to the two- and four-phase feeding programs. However, there was no evidence for difference for average daily feed intake, F/G, carcass yield, carcass leanness or income over feed costs (Figure 2) across all phase-feeding programs. Thus, simplification of feeding programs down to two dietary phases with lysine levels closely set to the requirements does not compromise overall growth performance, carcass characteristics and profitability in the grow-finish period. Figure 1: Effect of phase-feeding programs using dietary lysine at the estimated requirements on average daily gain of grow-finish pigs. Figure 2: Effect of phase-feeding programs using dietary lysine at the estimated requirements on income over feed cost per pig. 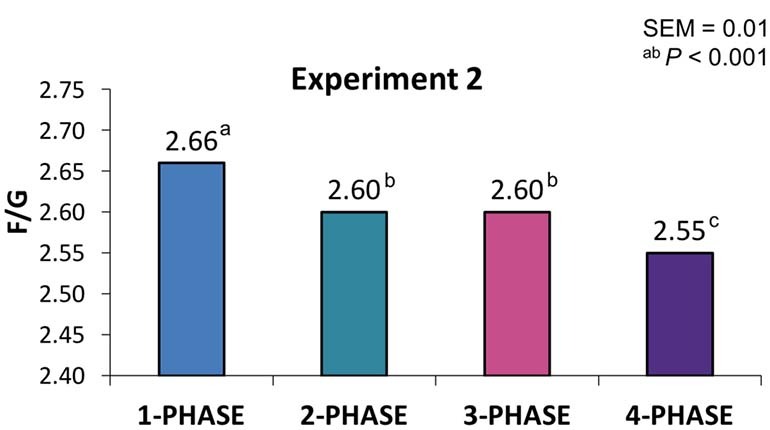 In Experiment 2, the one-phase program resulted in lower ADG compared to the four-phase program, with two- and three-phase programs intermediate (Figure 3). Consequently, the lower growth rate of pigs fed the one-phase program resulted in lower final bodyweight and hot carcass weight compared to other the four-phase feeding program. 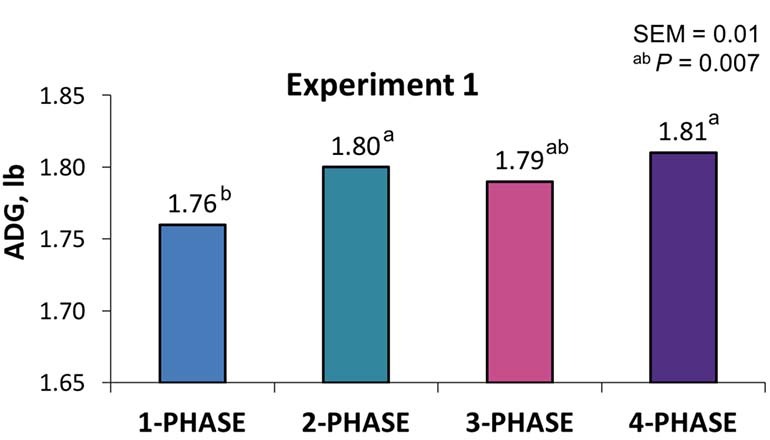 The one-, two- and three-phase programs resulted in poorer F/G compared to the four-phase program, with the poorest F/G observed in the one-phase program (Figure 4). There was no evidence for difference for ADFI, carcass yield or carcass leanness across all phase-feeding programs. 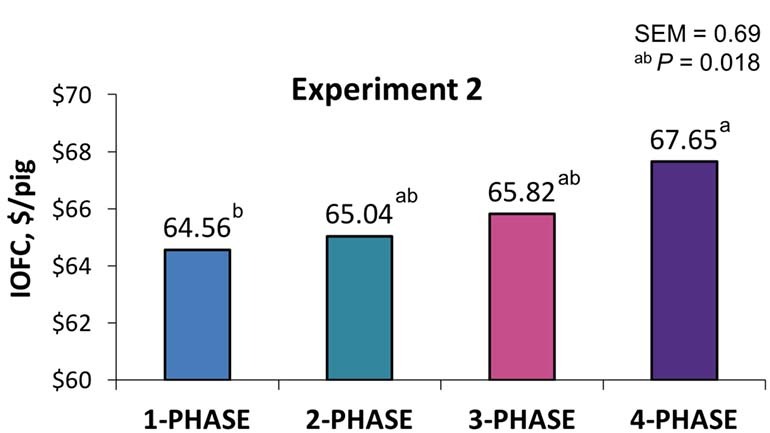 Figure 3: Effect of phase-feeding programs using a field approach on dietary lysine on average daily gain of grow-finish pigs. 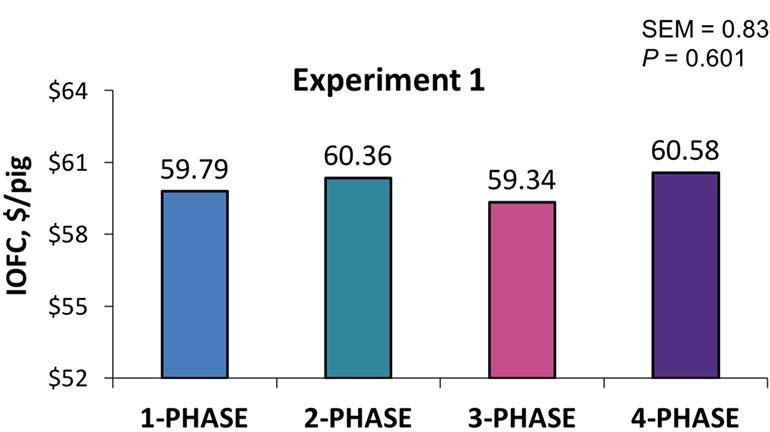 Figure 4: Effect of phase-feeding programs using a field approach on dietary lysine on feed efficiency of grow-finish pigs. For economics, revenue and income over feed costs per pig were increased in the four-phase program compared to the one-phase program, with two- and three-phase programs intermediate (Figure 5). Thus, when feeding marginal dietary lysine levels throughout grow-finish, simplification of feeding programs results in a negative impact on growth performance and profitability. Figure 5: Effect of phase-feeding programs using a field approach on dietary lysine on income over feed cost per pig. Taken together, the results of the phase-feeding studies conducted by the Kansas State University Applied Swine Nutrition team suggest that phase-feeding strategies provide advantages in growth performance over feeding a single diet throughout the grow-finish phase. Simplification of feeding programs for grow-finish pigs can be implemented provided that lysine is closely set to the requirements for maximum growth performance. This allows for the possibility of using fewer feeding phases during the grow-finish period which may represent practical and cost-effective advantages in feed manufacture, storage and delivery.